Lately more and more countries enter space launch services market (India, China). Moreover, private companies such as Space X, Orbital Sciences Corporation, Blue Origin, Rocket Lab and FireFly interfere into competitive straggle. In this struggle those companies win who offer minimum launch cost of 1 kg piggyback payload under required durability. Piggyback payload launch cost directly depends on innovative quality of the design, and, as a result, on production technology perfection of the most expensive units. As it is knows, the most expensive part of the launch vehicle is its engines. Their price reaches 40% of the launch vehicle cost . One of the most complex elements of a rocket engine in production is a regeneratively cooled thrust chamber. The complexity of its manufacture derives from the need to perform thin-walled shells with spiral ribs and the subsequent formation of the outer wall, which is a complex technological process. At the moment there are several most common manufacturing techniques for thrust chamber. On the territory of the CIS countries, thrust chamber with milled cooling channels and a brazed outer wall were the most widespread . Technological process consists on the following chain: with the help of a rotary drawing or by stamping, it is formed a required geometry of the chamber segments with allowances for further machining. Further, it is performed milling of the spiral channels and subsequent soldering of external smooth-walled casing in a rotating vacuum furnace . After that, all segments of the chamber are gradually assembled and welded into a single node in an atmosphere of inert gases. On the territory of the USA, there were widely used tubular thrust chambers (F1, J2), where channels of a thrust chamber are presented in the form of welded together tubes with variable geometry and chambers with an outer wall made by electroplating . All of the above methods have several disadvantages. First of all, it is necessary to note a need of a large number of special equipment and accessories, complexity of technology fine-tuning, high probability of rejects due to the huge number of technological operations and, as a result, high cost of production. Recently, a wide range of additive manufacturing technologies began to be actively developed and introduced in mechanical engineering as an alternative to traditional approaches. In the article it is considered features of the use of one of such technologies for the production of regeneratively cooled thrust chamber of rocket motors – selective laser melting of metal powders technology (SLM). To solve this task, it was designed construction, and it was manufactured rocket engine chamber with a load of 350 kg, there were carried out series of hot firing tests, fault detection and metallographic analysis of the structure of the material of the product . SLM is an innovative technology of complex products manufacturing through laser melting of metal powder under 3D models made in CAD systems. In fig. 1 it is presented a schematic diagram of 3D printer operation. Melting process on such equipment generates details of complex geometry, layer by layer, using 3D models as initial information. Thickness of a layer ranges from 15 to 150 microns, depending on a material used . 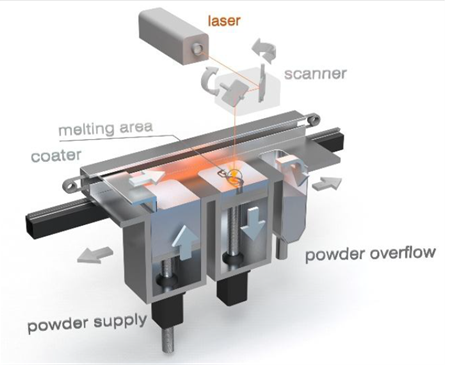 To melt a metal in the form of a powder, it is used ytterbium fiber lasers with a power of 200 to 1000 W, radiation of which with the help of mirrors on a high-speed drive focuses to required place of part contour formation . Each subsequent layer is manufactured by lowering the platform with the manufactured part by an amount equal to the height of the layer. After that, a layer of new powder is applied from the feed hopper with a power blade. The whole cycle is repeated until complete formation of the part over the entire height. In case of 3D printing technology usage, you can obtain parts of a rather complex geometry with maintaining mechanical properties of the material. As it can be seen from table 1, mechanical properties of samples made by 3D printing technology are not inferior to samples made by casting. Moreover, in some cases even surpass them . 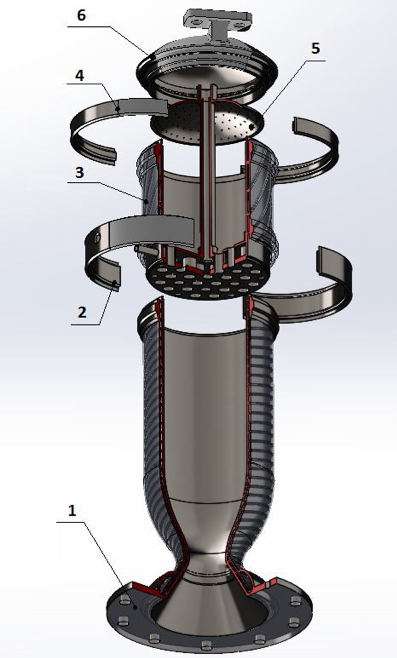 Designed and manufactured construction is a regeneratively cooled thrust chamber with spiral ribs having an inclination angle to the longitudinal axis of 74°. As a material for chamber manufacturing it was used heat-resistant steel Inconel 718 (an analogue of domestic ХН60МВТЮ). In fig. 2 it is shown a 3D model of the designed camera. 1. Parts 5 and 6 are welded. 2. After laying the catalyst, an internal weld is performed between resulting subassembly of parts 5-6 and part 3. 3. Cooling path is closed by half-rings 4 and external welds are performed. 4. 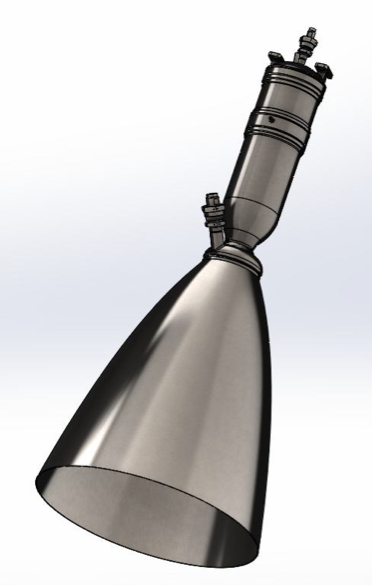 It is performed a weld seam of the nozzle head assembly and thrust chamber. 5. Cooling path is closed by half-rings 2 with subsequent execution of external welds. Taking into account substantial complexity, high labor intensity and high cost of traditional methods of producing regeneratively cooled chambers of a rocket engine, it was decided to work out the technology and manufacture the chamber in an additive way, leaving allowances for mechanical processing of the mated surfaces and welds. Internal surface of the combustion chamber after printing has been adjusted to the required purity by grinding. Also, it was performed a comparative metallographic analysis of a material in order to be clear about quality of the parts produced by 3D printing. Fig. 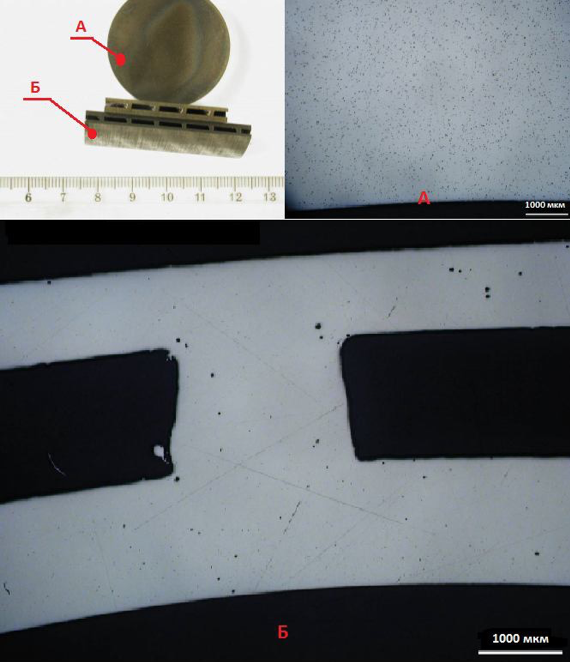 5 presents results of metallography of samples made by rolled-on relaxation and 3D printing method. As it can be seen from fig. 5, on the sample made by the 3D printing there are micropores. Where ρv is an actual density of the material, defined as an actual mass of the sample to an actual density. ρt is an information material density. Porosity value of the material ranged from 1 to 3%. It should be noted that this degree of porosity did not have a noticeable effect on the mechanical properties of the material. Also, based on the results of fire tests, it was found that the influence of high-temperature combustion products did not lead to the opening of surface micropores. Table 2 presents labor costs for the production of similar in size combustion chamber in traditional way and by 3D printing. 1. Additive technologies are promising for manufacturing of rocket engines combustion chamber. Technology usage is limited only by the dimensions of existing 3D printers operation area. 2. Additive technologies can significantly reduce production cycle of experimental designs and amount of necessary design documentation. 3. For thrust chamber production in such a way it is required significantly less amount of equipment and technological devices, which can substantially reduce production time, increase production flexibility and reduce cost of products in general. 4. Changes to design, which takes place during elaborating, do not lead to the need of re-equipment of the production. 5. It is possible to abandon complex technological processes of the cooling path. 1. Dehtyarev, A. V., Kushnarev, A. P., Popov, D. A. Raketa kosmicheskogo naznachenija sverhmalogo klassa [Small launch vehicle]. Space Technology and Missile Weapons, Dnipro, Ukraine, 2014, no. 1, pp. 14 – 20. 2. Synyarev, H. B., Dobrovol’skyy, M. V. Zhidkostnye raketnye dvigateli teorija i proektirovanie [Theory and design of liquid propellant rocket engines]. Moscow, Defense Industry Publ., 1957. 588 p.
3. Vorobey, V. V., Lohynov, V. E. Tehnologija proizvodstva zhidkostnyh raketnyh dvigatelej [Production technology of liquid rocket engines]. Moscow, Moscow Aviation University Publ., 2001. 496 p.
4. Huzel, D. K., Huang, D. H. Design of Liquid Propellant Rocket Engines. Huston, National Aerospace and Space Administration, 1967. 461 p.
5. Excell, Jon., Stuart, Nathan. The rise of additive manufacturing. Available at: http://www. theengineer.co.uk/in-depth/the-big-story/the-rise-ofadditive-manufacturing/1002560.article (аccessed 15.07.2017). 6. ConceptLaser a GE Additive company. Available at: https://www.concept-laser.de/en/technology.html (аccessed 15.07.2017). 7. Williams, C. B., Mistree, F., Rosen, D. W. Towards the design of a layer-based additive manufacturing process for the realization of metal parts of designed mesostructure. Proc. 16th Solid Free. Fabr. Symp. 2005, pp. 217–230. 8. Lewandowski, J. J., Seifi, M. Metal Additive Manufacturing: A Review of Mechanical Properties. Annual Review of Materials Research, 2016, vol. 46, pp. 11–14.